Rediff.com » News » Naga peace accord: If it's historic, why the secrecy? Naga peace accord: If it's historic, why the secrecy? 'To expect that these past decades of grief, inter-group killings, anxiety and fear will be brushed aside because of the Naga peace accord is being unrealistic. Memories are built on old wounds and they heal slowly. So, it is important to be cautiously optimistic,' says Sanjoy Hazarika. First of all, let us hail the peacemakers in their effort to establish a durable agreement between the Nagas and the Indian State. There are a bunch of questions and fascinating facets to the 'historic accord' between the Government of India's representative and the National Socialist Council of Nagalim (Isaac-Muivah), a week ago. I would refer readers to the statements, one by the prime minister of India, and the other by the general secretary of the NSCN (I-M) who is also known as the Ato Kilonser (prime minister) of the Government of the Peoples Republic of Nagalim. GPRN, which is largely floating non-territorial organisation that exists through its supporters and leaders in different places. It has numerous camps including ceasefire camps where the cadres are supposed to live with their weapons, but there is also Camp Hebron, the political and military headquarters set up formally after the ceasefire with India began in 1997 and a short distance from Dimapur, the commercial hub of Nagaland. And just to confuse people there are two GRPNs, one headed by Muivah and the other by his bete noire S S Khaplang of the other large armed group. Since the path-breaking 1997 ceasefire, the NSCN has insisted that the talks should be at the prime ministerial level or through his designated representative. This is the pattern that the discussions have followed over 80 rounds in 18 years. One, the nodal ministry, the ministry of home affairs, was out of the loop as were the ministry of defence and the army, which have key roles and responsibilities in the region which has seen over 60 years of conflict. 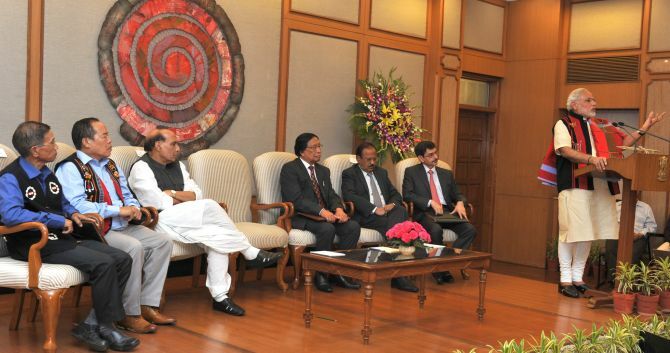 Home Minister Rajnath Singh received a briefing later in the week of the signing. These key departments of the Government of India are the ones which deal with the North-East on an hourly if not daily basis and have a huge presence there. Not briefing the three Congress chief ministers of Assam, Manipur and Arunachal Pradesh gave the Congress readymade ammunition to go on a full scale assault against the Bharatiya Janata Party and the prime minister. It would have been easier to handle had they been informed a little before the event and briefed in some detail after it. Such an approach would have reduced the speculation and quelled the rumours which are spreading rapidly across Manipur, even though there is no basis for them. Many commentators and editorials have been hot off the mark to hail the accord without seeing the contents. The signed document appears to be more in the nature of a declaration or a preamble, which has been discussed in the Naga region for at least two or three years. Minister of State for Home Affairs Kiren Rijuju called it 'a framework' for a permanent settlement. Will details of the settlement revolve around the 31 points which the Naga side had given to the Government of India about a decade back? Of these, two crucial clauses have been dropped: The one on sovereignty and expansion of Nagaland through territorial contiguity. These have long been unacceptable to New Delhi (not to mention the three states affected) and have been dropped by the Naga side as a compromise or fresh ones which are being discussed. If it is historic, then what's the need for secrecy? What is the concern about -- that the other groups would pounce on the accord and say,'We told you so' and accuse the signatories of selling out, the normal charge against those who make peace or at least seek to, in the region. The critical health of NSCN (I-M) Chairman Isak Swu was the trigger for rushing the process through. The government and the NSCN (I-M), one is sure, have faith in the maturity of the Naga people whose documented demand for a separate existence goes back at least to 1929. They are genuinely tired of the attrition, trauma, hatred, fear and bloodshed of seven decades and seek a long-lasting peace. Not unsurprisingly, many Nagas, who have seen three peace accords between 1947 and 1975, are being low-key and guarded in their responses. Celebrations are muted if not absent in Nagaland where there is abundant caution and some optimism about the signing of the preamble or statement of good intentions. Younger Nagas are traveling extensively and want to travel more, settle elsewhere, live well and work competitively across the world. Their voices, views and aspirations, and that of civil society -- which have been involved in conversations with the interlocutor for India and the NSCN (I-M) need to be accommodated. What will be the role of the NSCN leadership in the politics of the state and the region? Even a strong advocate of the NSCN's goals like Frans Welman of Amsterdam has raised questions and calling for the release of the chief arms procurer of the NSCN (I-M) who was detained at Katmandu and whisked away to India as well as the repeal of the Armed Forces Special Powers Act (which incidentally is also a demand made by a Nagaland assembly just a few days back). An important point to underline here is that for long, the NSCN (I-M) has been studying the Sami Parliament model, which is of the Sami people who live in Finland, Sweden and Norway and who have a single council spanning three countries. Their powers are limited, until recently they could not even extract from the rich resources below their soils -- that power remained with the national governments. But this power already vests with the state government in Nagaland. The question is whether, wherever there is a substantial presence of Nagas and the NSCN in Manipur, Assam and Arunachal Pradesh, would new councils be created just for them? The question arises what happens to existing councils such as the ones in the Dima Hasao Autonomous Council and Karbi Anglong where Nagas have a presence; how will parity be maintained among the Kuki and Naga-dominated councils, keeping in mind the deep suspicions that each harbour toward the other? Some of these issues may be clarified at two events this week: The first is Muivah's scheduled address to his supporters and the Naga people on August 14 at Camp Hebron where the Nagas will celebrate their 'Independence Day.' This is to mark the day a telegram went from the Naga National Council in Kohima to the UN announcing Naga independence. Here's another point: how will a future agreement accommodate two such national days? Other details, whether general or otherwise, are likely to emerge from the prime minister's August 15 speech from the ramparts of the Red Fort. So let us watch these two events, one in the Intanki forest of Nagaland and the other in the heart of historic Old Delhi, to get a sense of where things are heading. We can wish the peacemakers and their discussions well as we do the Naga people and their civil society groups, that they emerge from the nightmare of stress, violence, bloodshed, intimidation and extortion that has become such a normal life statement. The armed groups and the government have a lot to answer for. The demand by the Nagaland assembly for the repeal of the AFSPA cannot be brushed off, even though successive governments since 2006 have refused to handle this challenge since the Justice Reddy committee submitted its report. To expect that these past decades of grief, inter-group killings, anxiety and fear will be brushed aside is being unrealistic. Memories are built on old wounds and they heal slowly. So, it is important to be cautiously optimistic. Sanjoy Hazarika is a columnist, author, filmmaker, director at the Centre for NorthEast Studies, Jamia Millia Islamia, and managing trustee, C-NES. IMAGE: Prime Minister Narendra Modi speaks after the signing of the Naga peace accord, August 3. Peace at last, peace at last. Thank God Almighty, peace at last.